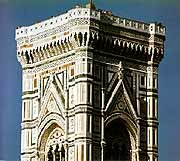 The belltower of Santa Maria del Fiore, one of the most beautiful in Italy, was an (extremely costly) invention of genius by Giotto which was created more as a decorative monument than a functional one. In 1334 the great artist was nominated overseer of the building site for the new cathedral, when work on it had already been interrupted for over thirty years, and was commissioned to continue the construction. However, instead of concentrating on developing Arnolfo di Cambio's project for the Cathedral, Giotto preferred to create something of his very own: the belltower. The artist worked from 1334 to 1337, the year of his death, on the addition of the new architectural element that was to enrich the square, but only lived to see the first floor of his project completed, where the pointed entrance stands. His painter's formation led him to proceed with the external revestment while the building was going up, thus slowing down its completion. White marble from Carrara, green marble from Prato and red marble from Siena colour the surface while also dividing it up with classical rigor; a figurative "narrative" (an indispensible form of expression for a painter) runs around all four sides, carried out with a series of octagonal tiles in relief by Andrea Pisano (who completed the South Doors of the Baptistery in 1336) from designs that were carried out in part by Giotto himself. In fact it was Andrea who was to take over the assignment from Giotto on his death, to be replaced in his turn in 1348 by Francesco Talenti, who completed the tower in 1359 and delivered it to the city as we see it today, though after making one or two changes to Giotto's original project. The extremely elegant and slender structure, (it is 84,70 metres high by 14,45), is on a square plan and supported by polygonal pilaster-shaped buttresses at the corners that continue up to the top. These four vertical movements, crossed by the four horizontal lines that divide it into five storeys, lend continuity to a construction that passed through the hands of three different artists. Andrea Pisano, who managed to complete the first two storeys, continued to respect Giotto's original project. He repeated the tiled decorations on the exterior (some by Andrea, others by Luca Della Robbia) but changes can already be seen on the second storey (divided into two rows like the first). The bas-reliefs were replaced by sixteen niches destined to contain statues of Prophets, Sybils and St. John the Baptist (carried out between 1419 and 1436). A second row of niches, this time hollow and carved in marble, were placed above them. The double row of bas-relief tiles on the first storey (allegories of manual labour, symbolic figures of planets, the Virtues, the liberal arts and the Sacraments) and the sixteen statues on the second storey have now all been replaced by copies (the originals are contained in the Museum of the Opera del Duomo). 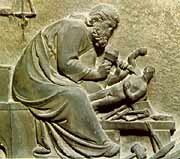 The statues include masterpieces by Nanni di Bartolo and Donatello, among them the famous Abacuc (which the Florentines called "lo Zuccone" or pumpkin, because of his bald head), an intense figure full of tormented spirituality, which was carried out between 1423 and 1436, at the same time as the Prophet Jeremiah. The three upper storeys of the Belltower were instead carried out by Francesco Talenti, overseer from 1348 to 1359. Here the sculptures and huge slabs of marble make way for enormous vertical windows that "open up" the walls and inundate the structure with light. These pairs of two-light windows (on the third and fourth storeys), together with the single three-light window (on the fifth), give the entire structure a delicate and elegant aspect, typical of the Gothic style, but do not suffocate its overall "classical" effect. This is also thanks to Talenti's solution for the top of the tower: a large projecting terrace that not only forms a panoramic roof-top but also substitutes the cusp that was usually found on most Gothic belltowers. A drawing in Siena shows us how much more banal this type of roofing would have been. According to tradition, when Emperor Charles V of Hapsburg saw the belltower, he said that it was such a precious work of art that it ought to be preserved under glass.